The latest trends in men’s styling are all about mixing and matching. It’s not enough to see a hairstyle that you like and adhere to it. 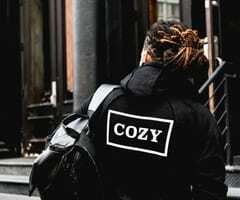 If you really want to be stylish or considered a style icon or a trendsetter, for that matter, you have to know how to make several in-demand styles work at the same time. 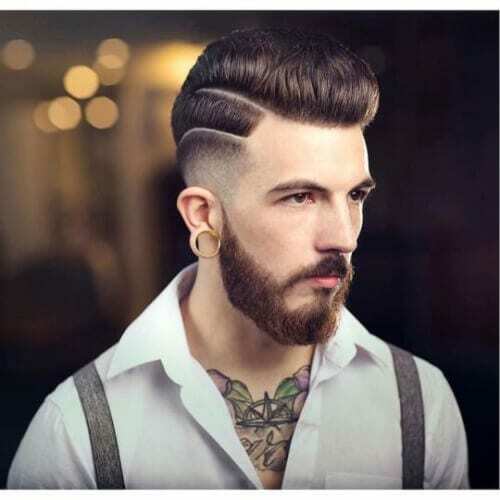 Two perfect examples are beautiful beards and cool fades. 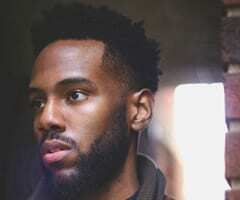 If you need some help or inspiration, here are 45 bald fade with beard ideas that you can take to the stylist right now. The great thing about this style is that you can shape it into anything you want and make it work for any occasion. It might look rough and rugged but with the right amount of hair wax, you can create beautiful waves appropriate for a dressy party. 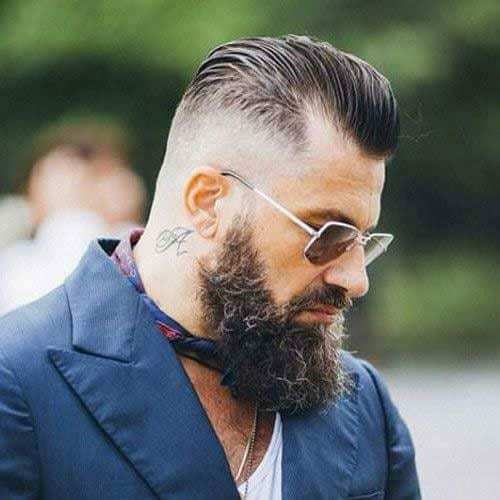 The beard fade is a gorgeous way to shave off a few years. Pun intended. 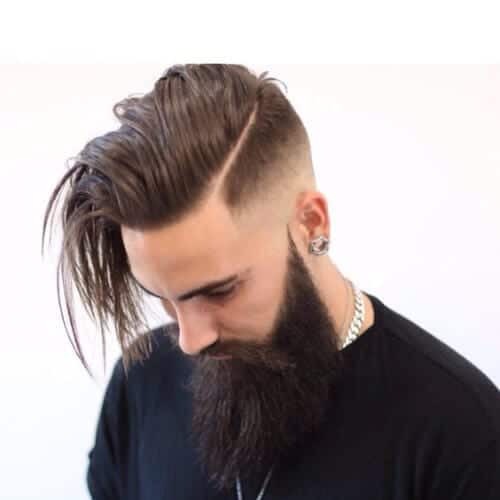 It’s a thoroughly young hairstyle that will help you shed your mature image and make you look cool and hip. Who are you calling a dad now? Mixing the slick back with a bald fade is a bald move. Another intended pun. 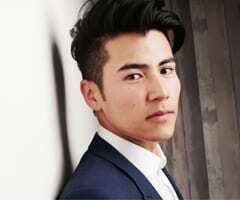 The style is not easy to pull off, especially if you have a receding hairline or the beginning of a bald patch. Still, if you have a good hairstylist, he can make you look like a million bucks. The bald fade with beard is by default a disconnected hairstyle. 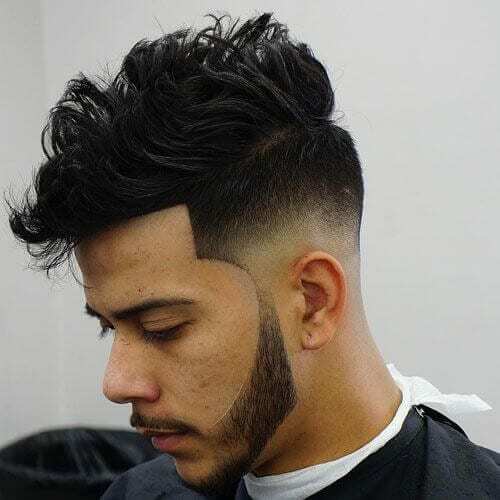 This idea means that your hairline and the beard line are discontinued by the fact that you have shaved a portion of your hair in the middle. Adding a hard part is a question of taste. This is what we would call the no-frills approach to our main theme. 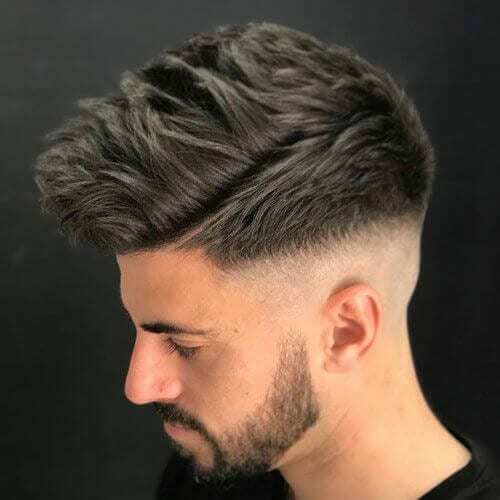 It’s the simplest haircut you can get, not too short and not too long, but with a bald fade on the sides and in the back. Evidently, it also comes equipped with a well-trimmed beard. The Caesar is named thusly because this is the haircut the Roman emperor seems to be sporting in the statues we have depicting him. 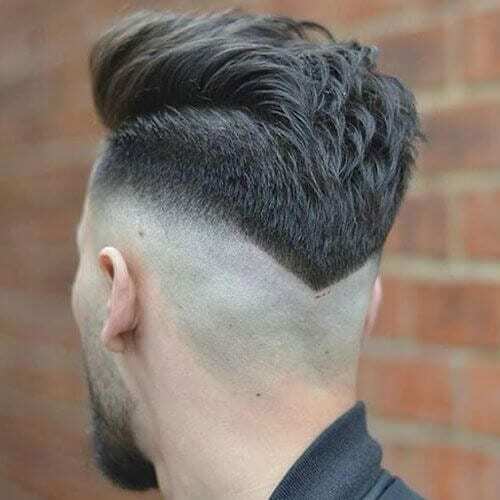 It’s a hairstyle that has caught on again in the past few years and which you can now pair with a bald fade. Having curly hair can be both a gift and a curse. 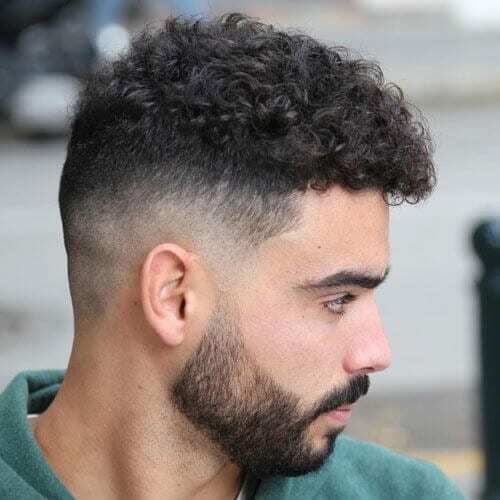 It’s definitely what we would call a beautiful head of hair, but owners of such a delight will often tell you how difficult it is to maintain. A bald fade might take some of the pressure off. 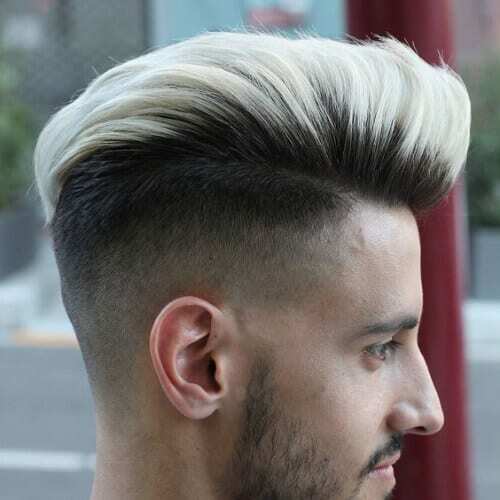 The modern age has seen the birth of the so-called fauxhawk. It’s a recreation of the mohawk and it literally comes in hundreds if not thousands of shapes and sizes. The only limit is your imagination. Or your stylist’s imagination. 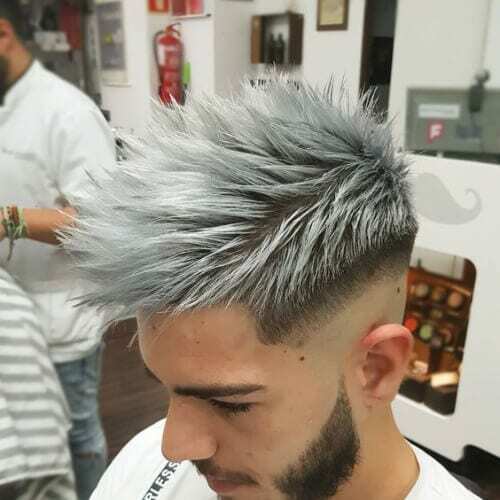 Here’s another type of fauxhawk, this time with a more pronounced bald fade. 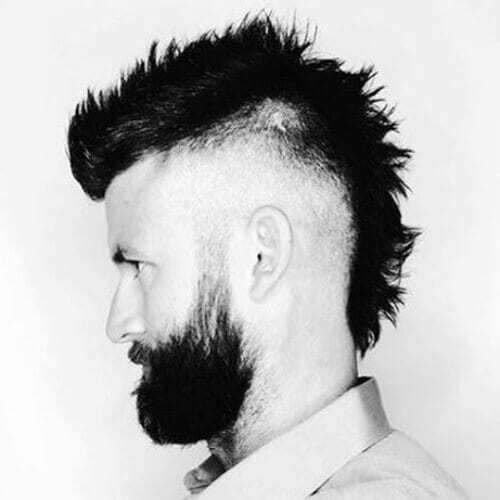 It clearly borders on a more traditional mohawk than anything else, only without the edge of the 70s punk rock style. 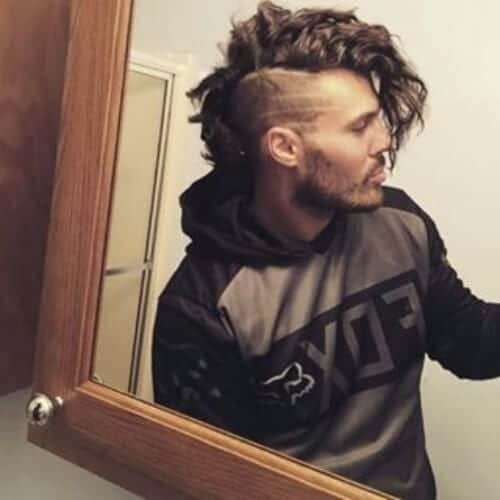 You can even sport a fauxhawk with a bald fade if you have curly hair. 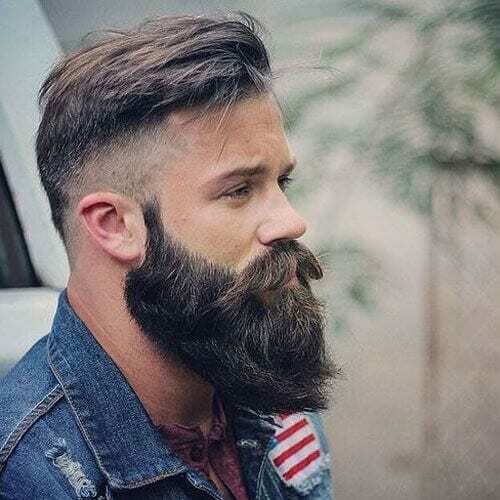 You get to decide its length and volume, as well as how bushy you want your beard to be. Don’t forget to get your eyebrows done as well! One of the most beautiful trends to hit 2017 was the man braids. 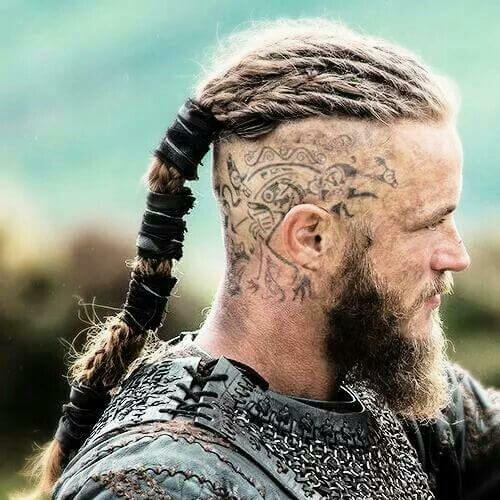 Men seemed to return to an older period, when warriors such as the Vikings used to sport braids in their hair as a symbol of courage and victory over their opponents. When you go to the stylist, it’s important to know what type of bald fade you want. You can get the classic, the very high bald fade, such as the one you saw above with the mohawk or you can get a low bald fade. It’s entirely up to you. If you love this hairstyle and want to copy it, here’s a pro tip for you. Stock up on hair gel, hair wax, and hairspray. 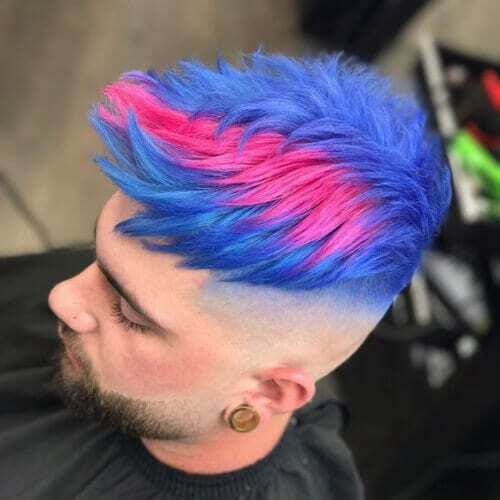 This kind of style requires a lot of product to keep it in place. Also, make sure you invest in a high-quality one, that doesn’t affect your hair. 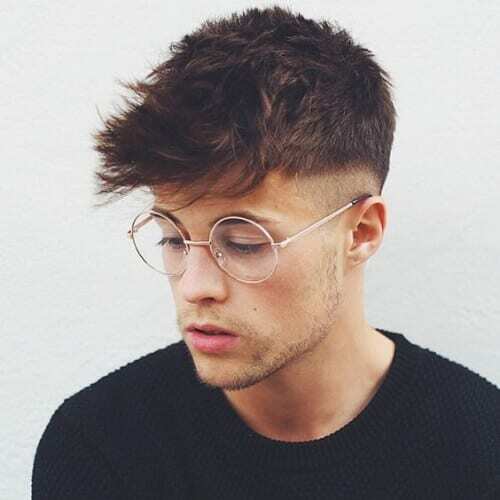 However, if you’re not into using so much product in your hair all the time but still want to get a bald fade, go for a messy and textured look. You can run your fingers through your hair to style it or use a soft-haired brush. 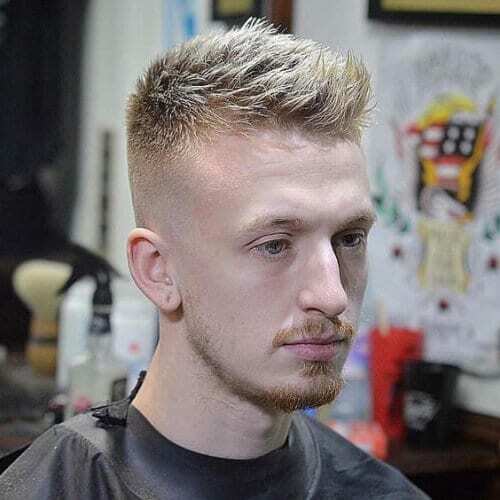 Here’s a style that combines the very modern and contemporary bald fade with the voluminous spiky tips of the early 2000s. You know, just in case you missed that decade. This hairstyle will elongate your face and highlight your cheekbones. 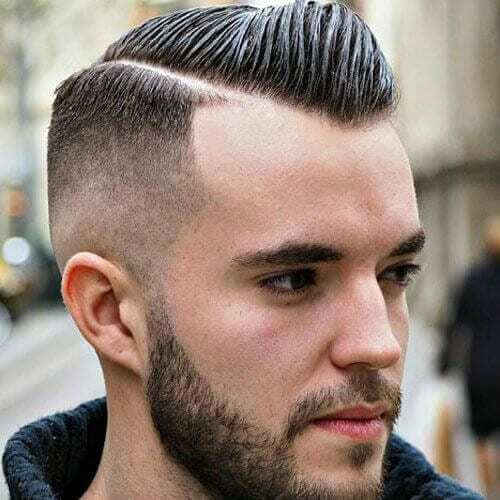 Just like with every other hairstyle in existence, of course there’s a hipster version of the bald fade as well. And it’s gorgeous. The hair mirrors the Victory Rolls of the 40s and 50s, which were then worn by the ladies, but which are now unisex. The moustache is, evidently, a handlebar one. 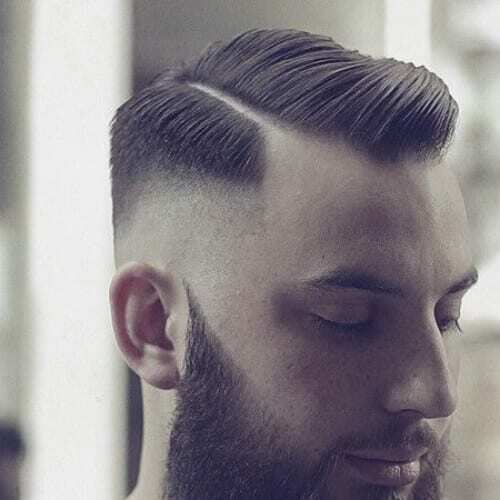 Here’s another twist on the bald fade with beard that reminds us of the 90s and early 2000s. The super thin spikes in the front used to be worn by every single teenage boy out there. In this case, they were paired with a ginger goatee and a very light stubble. 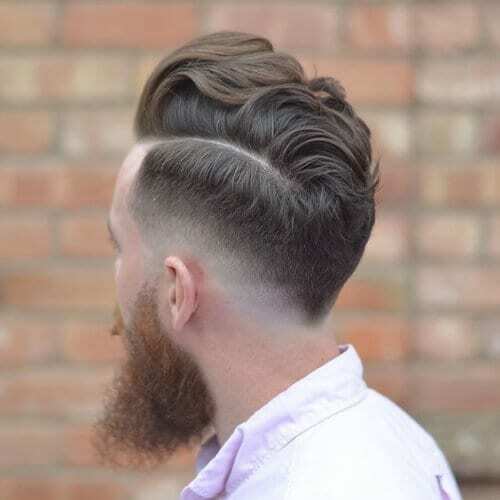 Even though the middle section between the hairline and the beard line is a bald patch, that doesn’t mean it has to be boring or simple in any way. 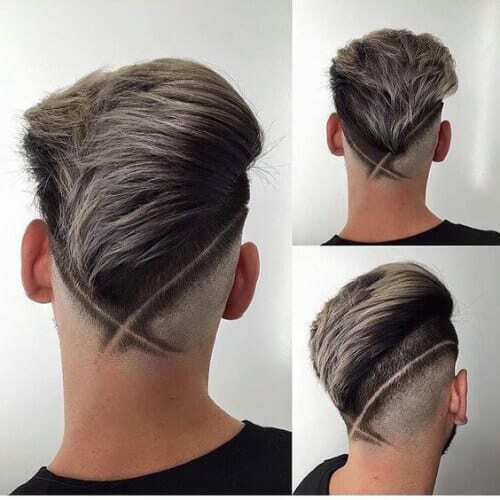 You can keep things interesting by adding designs, such as this classy V shape at the back of the head. 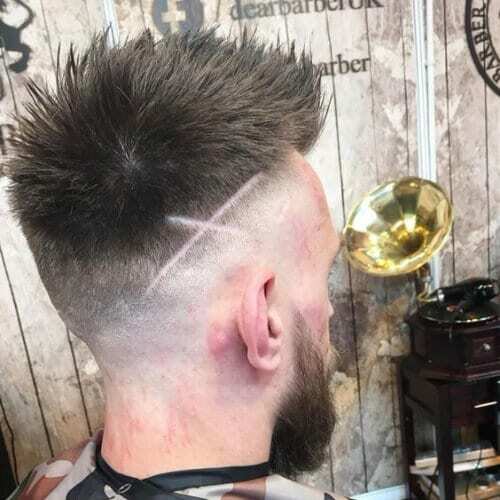 In case V is not your letter or you need something a little more creative or edgy, you can ask your stylist to give you this X. Here’s a tip, though. Don’t try this at home by yourself. It might not go as planned. 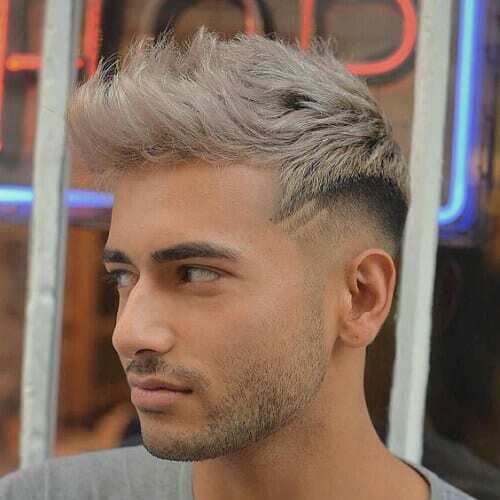 Remember the frosted tips we all used to wear when we were teenage boys? They are back now that the fashion and styling world are going through a revival of the 90s. But they have received a huge upgrade. Meet the trend that swept across nations a few seasons back but which you can still get if you fell madly in love with it. This is the merman style. It requires you to dye your hair in a kooky color or combination of shades. 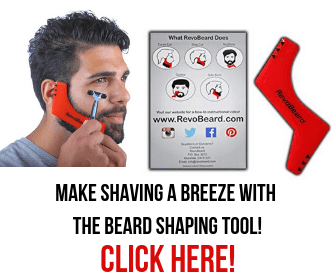 You can even do your beard. 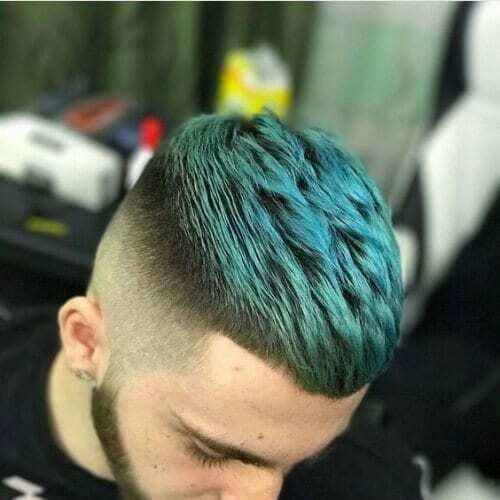 Another color which you can try for the merman style is a dashing peacock green. It has a bit of teal in it as well as some metallic tinge, which makes it perfect both for a night out and your favorite music festival. We’ll be honest. We fell in love with this intricately composed hairstyle on sight. Not only does it have a bald fade, but it also sports two hard parts. This means that the haircut is disconnected three times all over. Wow! 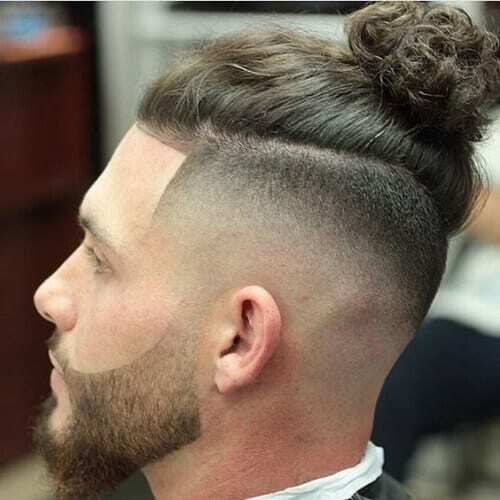 There’s no way we could have compiled a list of the latest and coolest hairstyling trends for men without talking about the top knot. Yes, it’s still with us and men all over are still loving it in different styling combinations. 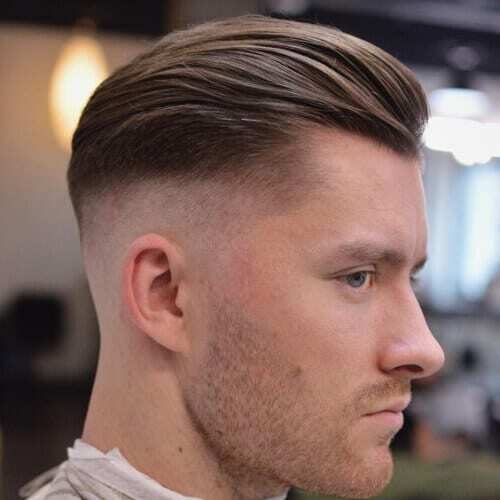 This is a fantastic type of slick back which you can adopt in case you have a receding hairline. 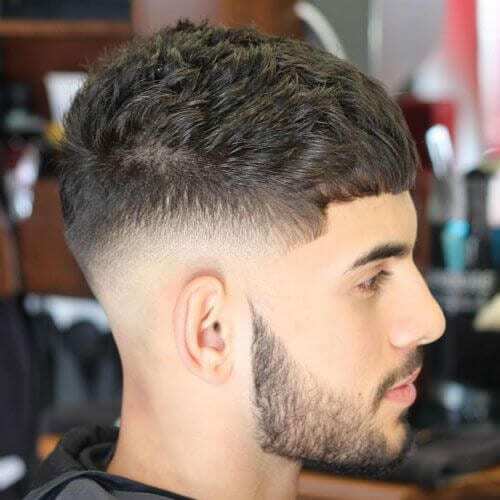 It starts very low at the front with a widow’s peak and elongates the length of your head, parallel with the bald fade, masking any natural shortcomings. One of the classic hair color choices is blonde. It’s very trendy right now, so you can easily go for a shade that highlights your skin tone as well as the color of your eyes. It will make for a nice contrast with your beard. 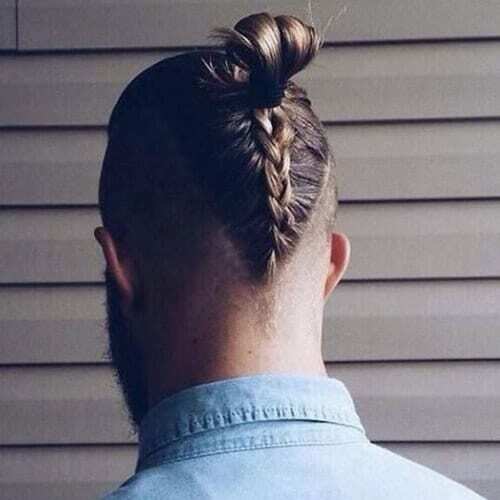 There’s the top knot, the man bun, and then there’s the samurai bun. 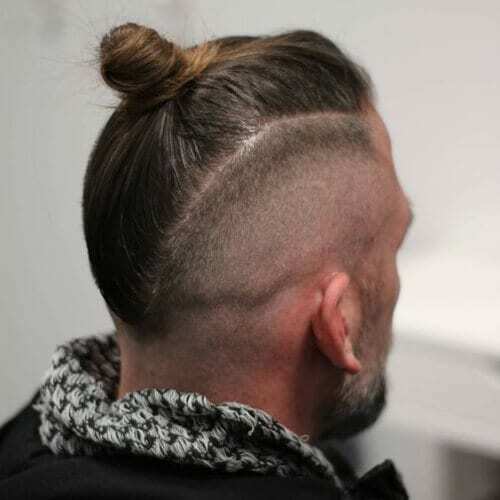 It’s a highly sophisticated type of bun, with a very clean-cut finish that will make you look elegant and dapper, especially if you pair it with a stylish bald fade. 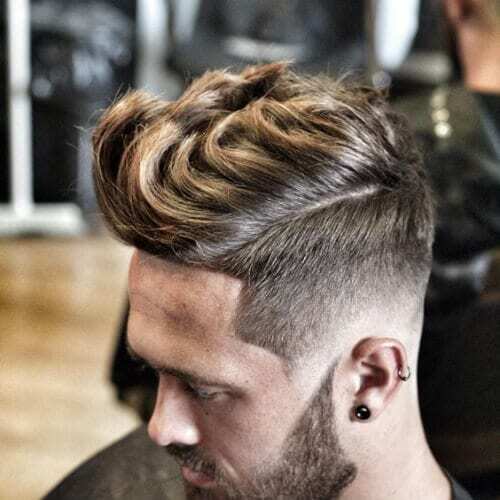 This high and layered quiff is mesmerizing to behold and you can honestly be called a styling guru if you can wake up every morning before going to work and pull this off to perfection. Good job! 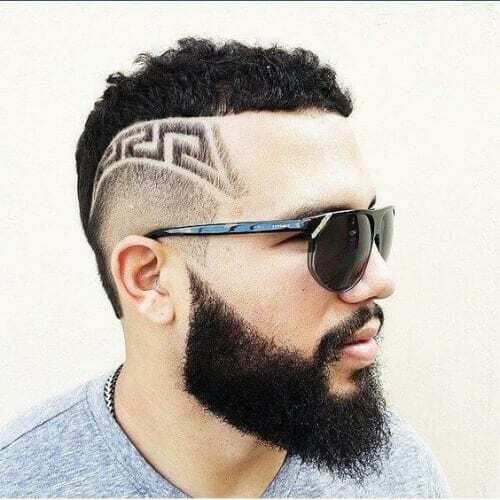 Not even celebrities remained indifferent to the idea of a bearded fade. 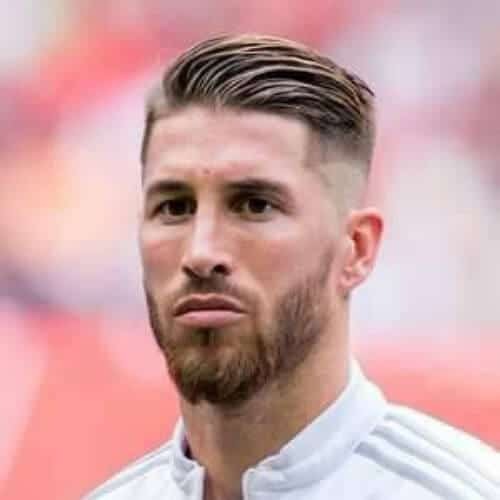 Here is famous soccer player Sergio Ramos with a comb over slicked with some hair wax, a bald fade, and a very beautifully manicured beard. If Harry Potter lived at the end of the 2010s and if he were real, this is what he would have looked like. 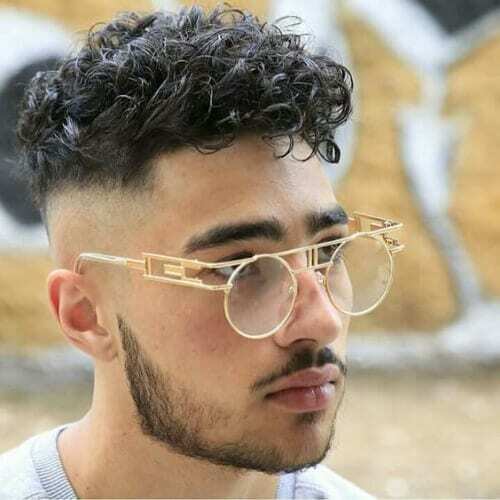 A tuft of messy jet-black hair with a bald fade, the beginning of an adolescent’s beard, and the famous round glasses. Styling a curly top can be as easy as saying one, two, three, gel! Apply a liberal amount and run your fingers through it until you settle it in the desired shape. 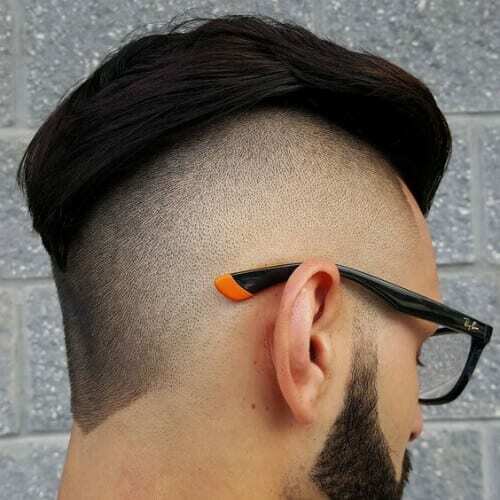 The bald fade will give it an extra modern look. Even though it might be a bit hard to master at first, we promise that you will get the hang of braiding it yourself with a little bit of practice. If not, you can always ask your girlfriend to do it for you! This is what taking a bald fade to the extreme looks like. 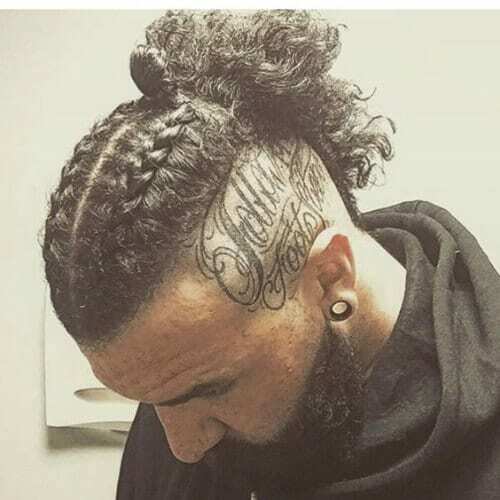 The entire side of the head has been turned into a fade while the other is witness to a magnificent medium curly comb over. Please notice the parallel hair design. This man braid is even easier to do by yourself. It’s a simple three-strand braid that starts at the top of your head. Bonus – you can make it as messy as you want. The idea here is to show off the bald fade and your accessories. Here’s Ragnar from the famous TV series Vikings, played by actor Travis Fimmel. 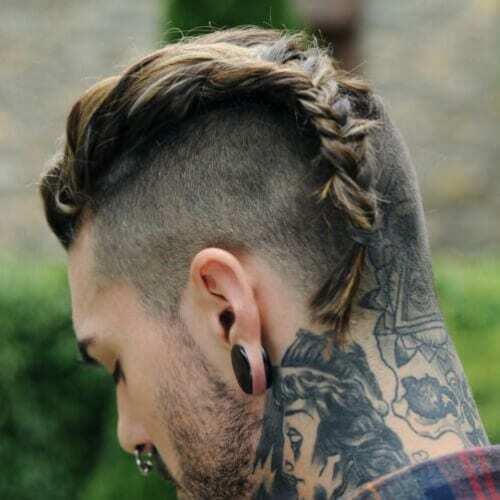 He’s wearing a traditional Nordic braided style which is surprisingly adequate even today, if you care to try it. It’s entirely manly and fierce. Here are more Viking haircuts to inspire you. 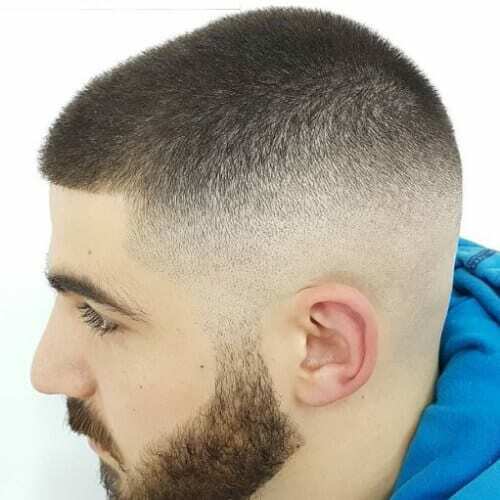 This bald fade is very minimal in its design, as well as clean cut and impeccably designed. However, it will require a lot of maintenance. This means that, as soon as your hair starts growing, you need to shave it right off. 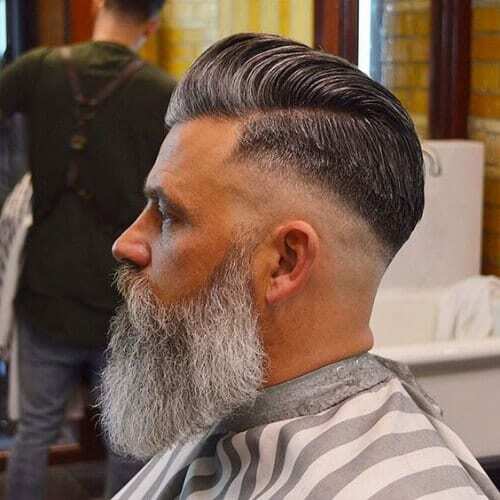 The bearded bald fade is so versatile that you can even pair it with a buzz cut. The hairstyle was originally a military one, but it soon seeped into pop culture and now you can sport it too. It’s perfect if you’re looking for a no-fuss cut. Here’s Zayn Malik wearing the same type of buzz cut, proving that you can make it work even at a red-carpet event where you have to wear a suit and tie and really look your best. He has paired it with his usual earrings. 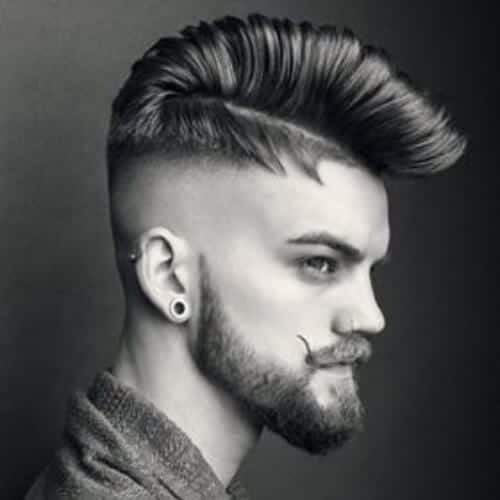 Nothing says stylish and modern like a quiff, a hard part, a bald fade, and a patterned beard all rolled into one. Don’t forget your designer sunglasses and your leather jacket for an excess of cool. 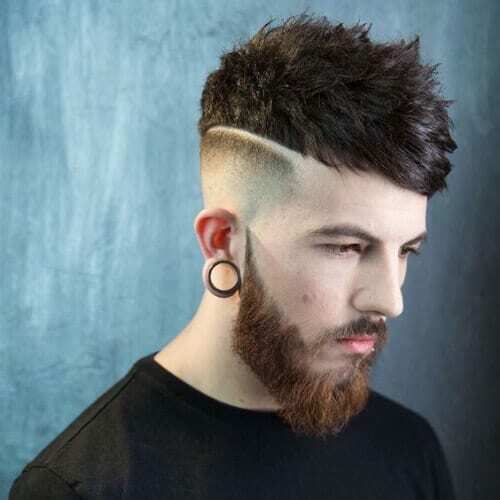 If you’re feeling creative, you can try a range of hair designs or tattoos that can embellish the bald fade. This is a Greek pattern, very simple and classic. You can go for anything you like, from Captain America to your favorite brand. This asymmetrical haircut has really been a staple during the past few seasons. It’s edgy and underground and incredibly easy to style and maintain. You can also accessorize it very easily with a pair of silver earrings and a bling necklace. There was no way we could have talked about hair colors in this article and not mention the biggest hair coloring trend of all. It has simply swept the world over, and you know what we’re referring to – gold. This is light platinum gold, but you can choose whatever shade you like most. 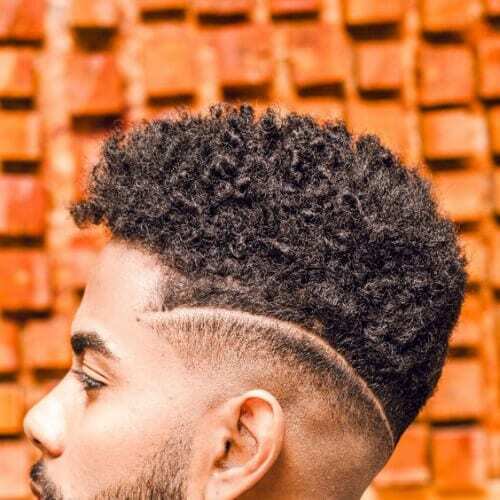 This is a super short, high and tight afro with a bald fade on both sides and in the back. 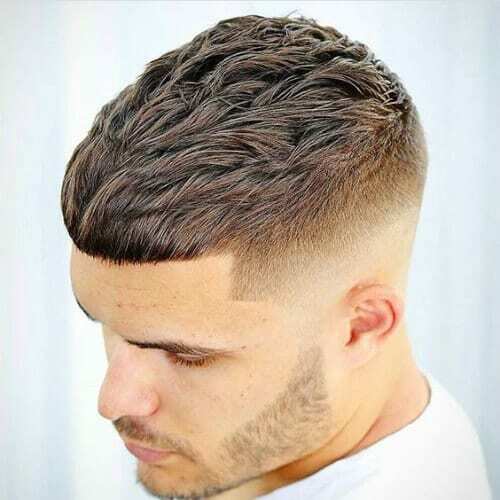 It also sports a design line that fades away as it reaches the back of the head, making the hairstyle look slick and elegant. With so many hair designs to choose from, it can be difficult to make up your mind sometimes. However, if you simply want to make a statement, remember that less is more and go for a minimalist design. The message is the most important part. A hard part usually follows the natural parting of your hair. The difference is that you need to go to your stylist to get one. 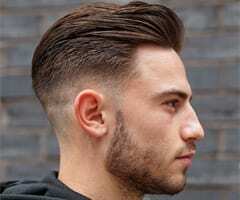 He or she will use a razor to shave a thin and straight line that imitates a natural parting in your hairline. Fashionable! 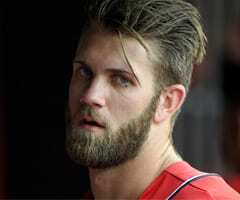 The popularity of the beard has grown more and more in the past few years. 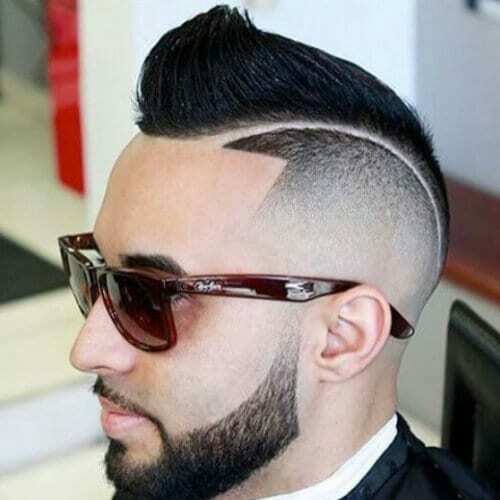 Therefore, there was increased pressure in finding stylish haircuts to accommodate lush beards and highlight them at the same time. Enter the bald fade which frames groomed facial hair perfectly and allows it to shine in all its glory. 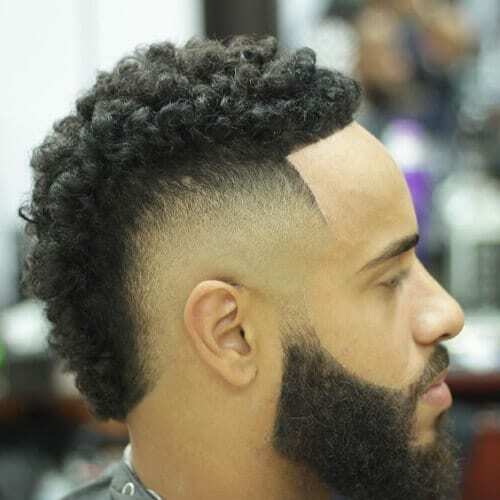 Let us know in the comment section below what is your favorite bald fade with beard style!